The ride from the airport to the Holiday Inn was very interesting, my driver would drive up behind other cars in his lane at about 110 Kilometres and then turn on his hazard lights and head lights and flash them until the car in front would move over. I never understood why, but it did help move through the traffic very quickly. However no amount of light flashing could help us once we hit the 7 pm traffic in Seoul, he we just had to crawl along with the rest of them. I had to meet Larry my colleague at 8 pm for dinner; I was only just on time to do that, when I finally got into my room in the hotel. Boy was this room small, I think someone must have taken a chainsaw and cut a real room in half. It had most things in it but it was just very small. The first thing I had to do was take a photograph of how small my room was, it was not a big photograph.Larry and I found a bar on the ground floor, they had a lady singing with a group of string instruments and a piano, we decided this was a little high brow for us so we head up stairs to a bar on the top floor. 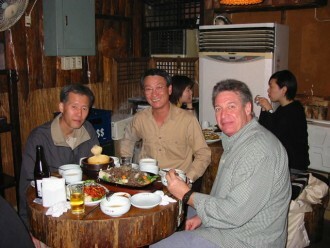 I found out that Larry new enough Korean to get us into trouble almost immediately. We no long got settled in the Bar and the lady with the string band and piano player turned up to play for us. After a week there we got to realize the management had supplied this group of musicians to ensure that we gained at least some culture in Korea, as she was always in a bar where we were drinking.We have had our first day working; a Sunday and for dinner we went out the back of our hotel into a market area. We were looking for Japanese food, but only found Sushi, which was not what we were after; we hunted around and finally went to a Korean place that was Korean Ribs. Larry said he was going to try Korean Ribs because he was from the town that had the best ribs in the state, and the State that had best ribs in world that is Texas.Well this was absolutely tremendous; the restaurant had no other Europeans in it. Nobody spoke English at all. Fortunately the menu had some English on it. We ordered fresh Ribs and what a great feed. The table had a burner in the middle of it about six inches sunk in the table. The cooking plate was ring that sat up like a headlight cover over the flame. Most the locals cooked their own, a bit like the stone grill. However the ladies realized we were dumb Europeans and cooked for us. They showed us how to eat the food and looked after us well. These were pleasant but very stern women and we felt like we had better do exactly as we were told or we would be sent to the corner without any more dinner.The Ribs were cut up into about 25 to 40 centimetre pieces with a pair of scissors, there were no bones??? They were cooked with mushrooms. The side dishes were about 8 in all, again in little bowls. These off course included Kimchi, which I now know as a marinated cabbage, which is Garlic and hot spice flavoured. There was some raw marinated meat, fruit in a sort of white dressing, maybe of a yoghurt base and several things in chilli and/or garlic sauces. Boy you could not get within 10 meters of my breath for days after. The food was eaten with Chop Sticks, and ladled onto lettuce leaves. So you took meat off the burner onto your lettuce leave and added the Kimchi and other bits from the 8 or so bowls around the table, including raw chilli, chilli paste and raw garlic. Then eat the lettuce with everything inside. Wow it was great and all washed down with glasses of OB beer. I am sorry to harp on about this meal but it was wonderful and probably the best foreign food experience I have had. That is because it is the first time I have been like that where two dumb Europeans just walked into a local food place and eat whatever they served. It was a lot of fun communicating with the waitresses, and they were good fun once we overcame the language barrier. It is a good thing that Larry knows enough Korean to ask for beer and say thank you.Well I have done my first day of work in this city. It is kind of strange. The city is huge; it has a population of about 12 Million people. The drive from our hotel to work is about a 15-minute drive on a six-lane side road, the roads are huge on the main roads and tiny on the back streets. The buildings are huge all the way. Larry tells me he was here for 18 months in 1967 – 1968 and the space between our hotel and our work was just flat land. Now it is high-rise as far as the eye can see. On our third night we went down towards centre Seoul, but I believe we did not get anywhere near the centre of town. Here we went down miles of tiny back streets and markets; they went on for longer and further than we could walk. We ended up having another Korean feed, another placed that did dinner like last night but not nearly as good. We found restaurants in this part of time that were like trucks parked on the side walk, with a tent at the back of them and tables and chairs in the tent. The food looked great and the smell was fantastic. We have decided we will go back and have a meal like that. This is the second night I did not take the camera out, tomorrow I will regardless. I thought we were going to a standard part of Western Town this night but it was completely the opposite. The drama of the day is getting a Cab from where our hotel to the Unisys office. Larry has to direct the Cabby with his few words of Korean and lots of hand gestures. Coming home is not usually our problem. 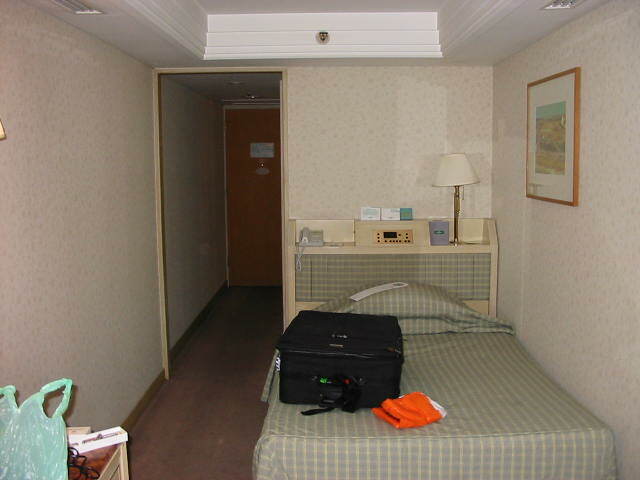 We get in our cab an say Holiday Inn Seoul and seems to work.However we finished work at about 5 pm and were heading back to our hotel. the road outside the office is six lanes in either direction The cabs all sit smartly in a row, they are black purpose built cars with smartly dressed Koreans in suits, white shirts and ties. We go to the first Cab in the line, there are to cabbies sitting in the cab listening to the radio and talking. When we arrive they make a big fuss about getting organised and ensuring we get into the cab.The driver gets directions from us and at the same time he turns the key, oh oh? Nothing happens, he tries again and same result. He opens the door and yells at the cabbie behind us. This guy drives down the lane next to us and does a three point turn in the middle of the traffic so he is facing the wrong way in the lane next to us with the bonnet of his car next to the bonnet of the cab we are in. There is much waving of hands and discussion and the bonnet of our cab is opened. The guy who brought the other cab up, gets out a pair of jumper leads and connects them to our car, then reaches into his cab; he connects the first, then he moves to connect the second. There is a huge spark and cable fly’s up. Now there is a lot more yelling and waving of arms and he pushes the second part of the cable on again, this time with much more conviction. There is a huge flash of light, and thick cloud of smoke comes from under the bonnet of his car and when the dust clears comes a very blacken Korean, holding in his hand the cable with one clamp on and the other completely melted away. He had put the wrong clamp on the wrong battery terminal.There is much more yelling and waving of hands and the poor man has to go back under his bonnet again and this time he connects them the correct way around. Our driver starts his car, and away we go. Leaving his mate on the side of the road with the smoking cables, smoking attire, and his car facing the wrong way in peak hour traffic.Although the days were clear, and the temperature was around 12 – 14 degrees centigrade the air was thick with haze and I suspect smog. Visibility was no more than a couple of kilometres at any one time, on the best of days. With that came the smell, and it was not unusual to see locals walking around with cloth filters over their nose and mouth.Larry and I found a couple of other “interesting” places as well. In the building next to the Holiday Inn is a big office block. This building on the side door next to the hotel entrance has a sign up saying Casino, coffee and beer. We decided to venture down in the basements it pointed to and see what it was all about. 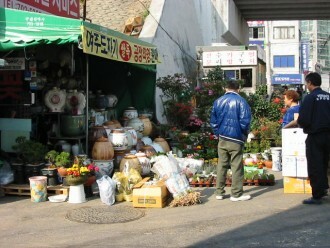 We found lots of little businesses, with things like travel agents, flower shops etc. There were places here that looked a little like bars, however they were corridors of lots of rooms. These establishments were very smart, and had lavish wood grain panelling on the walls. A doorman was at a counter just behind the doors. We asked at the first one we came across what this was. After a lot of difficulty trying to understand this guys English (and he our very very bad eight Korean words) we established this was a Whiskey house. Well that did not seem right, there was very little sign of Whiskey. We asked how much, and he said 1 Million Wan????? That is about $400 Australian, we were just beginning to twig where we were and a door opened and behind it was about 5 girls sitting around the a table playing cards, we were beginning to understand what a Whisky house was. We visited one more, to just check our theory and apart from the fact this next was $9 Million Wan, it was the same. Under this building in the basement, there were three or four of these places; they were open and a part of the normal shopping environment. The shopping was more gentlemen’s shopping, with flower shops and barbers etc.Saturday Morning I decided to take a longer walk than I had done before. After seven days I have gotten to know the area out the back of the Holiday Inn quite well. There is probably about a half a square kilometre of shops, restaurants and markets. These all service an area of high density house above them. I ventured along a road that followed a railway line and went past some more districts of high rise apartment blocks, eventually it end up down in a very large market area. This was similar to the one at the back of our hotel, but it was bigger, more diverse and definitely poorer. Here most the food was on the street with street vendors selling fish, both fresh and dry, vegetables everywhere and hundreds of different types of beans and seeds in every colour of the rainbow. There were little old ladies sitting on the pavement with nothing more than a sack on the ground as their shop and a handful of lettuce leaves or spring onions for sale. There were other places that were big markets with several people running them.The shops were tiny and piled high with a mish mash of stuff, of what ever they were selling. The fruit stores, of which there seemed to be every second stall were the most organised. They sold melons, some of which I did not recognise, and I was to stupid to take a picture of, This fruit was a fat oblong fruit like, which was of a deep lemon colour with strips down it. The fruit shops were full of Strawberry’s, melons, Apples, Oranges, Nashi’s. The Nashi’s were the size of Melons, I have never seen them this size. The time of the year was spring and that, I suspect is why there were so many strawberries were on sale.The butcher’s shops were always nice looking places, small but very western in the way they stored and displayed their meat. It was clear that meat was very expensive, but not completely beyond people. It was sold in 100-gram amounts, and when I relate his to the food I eat, beef was on the menu however the dishes had a little beef and a lot of side dishes to go with it. The beef was sliced thinly in all the dishes I had, however it was omnipresent Fish however was sold completely differently; there were two major methods I saw. The method I saw most often was the fish laid out in boxes on the pavements, with a big board, it was cut on.Of course all fish is sold whole, I was surprised at the lack of smell around the fish sellers and I never, ever saw a fly or other insect, neither around the fish or anywhere I went in Seoul. The fish was always laid out very orderly, I saw one vendor who had a box of prawns, and each prawn was laid out in a pattern within a box, again these were just on the pavement in a box and NO ice??? They sold all sorts of fish in this fashion. The second method I saw for selling fish, was in tanks out side of shops and markets, these were alive and they were very big fish in a lot of cases. The tanks were in all the cases I saw, outside the shop; I did not identify any of the fish other than Squid, crab and lobsters.Other shops of note were the bakers, who had a huge arrange of breads, and cakes. Most of which looked fairly familiar, and smelled wonderful. The presentation in these shops was really a work of art, as was it with the confectioners. You could stand and look at these shops for ages and just imagine the wonderful tastes. I was fascinated by the Tailors, their seemed to be a large number of little shops with one or two people in them and a tailors mannequins, just as a part of the normal shops in the markets.